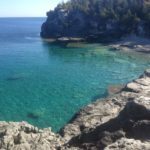 We visited the Tobermory area in early October and benefited greatly from the post-summer and pre-fall period when there are far fewer people clamoring to get to spots such as the sparkling turquoise water of the grotto at Bruce Peninsula National Park and other attractions in the area. 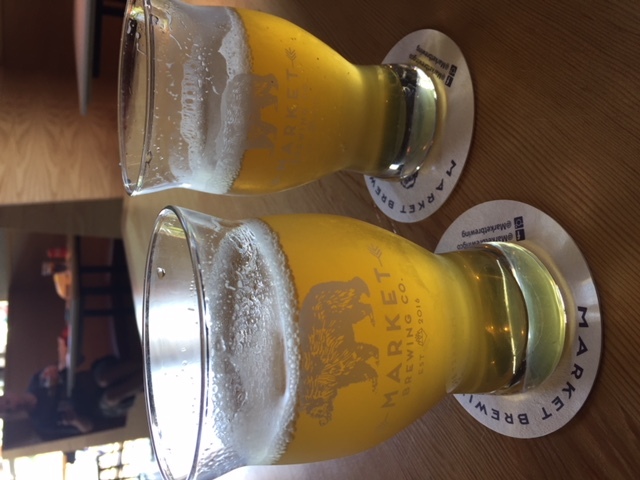 While some of the resort community businesses are starting to close down or shorten their hours in early October, we found it was a great trade off to be there when there fewer people. It was better to access attractions such as the park, but also because it was less hectic for the dogs and people were generally more welcoming of them being there. Spring and fall are recommended as best times to visit to avoid crowds. Long weekends and summer vacation time is the busiest and can make your visit less than enjoyable. 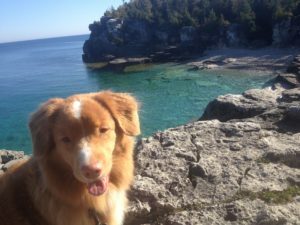 Our Nova Scotia Duck Tolling Retriever, Angel, enjoyed the hike to the viewing area overlooking the grotto at Bruce Peninsula National Park. 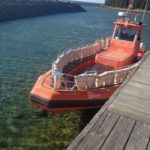 A highlight was being able to take the dogs on one of the glass bottom boat tours that ferry visitors through the waters of the Fathom Five National Marine Park. 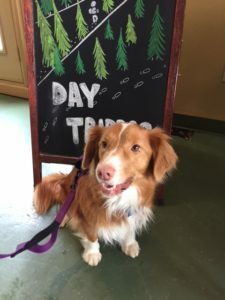 Instead of buying tickets for the boat tour ahead of time, we approached the ticket booth at Blue Heron Boat Tours the morning we wanted to go and asked if we could bring the dogs. 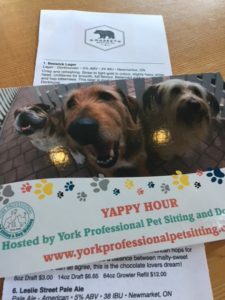 A TripAdvisor review I had read before we left home indicated dogs were allowed on the boat. 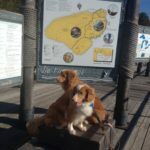 The tour operator told us that if the cruise wasn’t full that day they would let us on with the dogs. In a short time we were given the go-ahead and enjoyed the tour which goes around to the various sunken shipwrecks that have been there for more than 125 years, and as you will see in this video from the company, to the beautiful Flowerpot Island. The dogs were able to go anywhere on board (on leash). 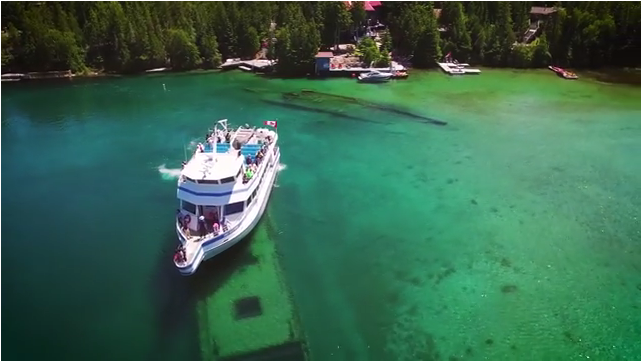 The Blue Heron cruises take visitors to see the shipwrecks and Flowerpot Island. 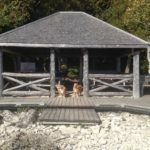 We were able to take the dogs on this boat and then hike across Flowerpot Island. To get to the island we departed the main cruise ship and boarded a zodiac to reach the shore of the island. From there we got off and stayed for about hours, hiking across the island, exploring the caves and let the dogs roam around the beach. The grotto at Bruce Peninsula National Park is an incredible place to explore with your canine friends. The grotto is a scenic cave area featuring an incredible pool of blue water, located on the Georgian Bay shoreline. During high season (all summer) the parking lot for this park fills quickly but in 2018 the park introduced a reserve parking system allowing you to book a four-hour time slot, making planning your excursion much more enjoyable. 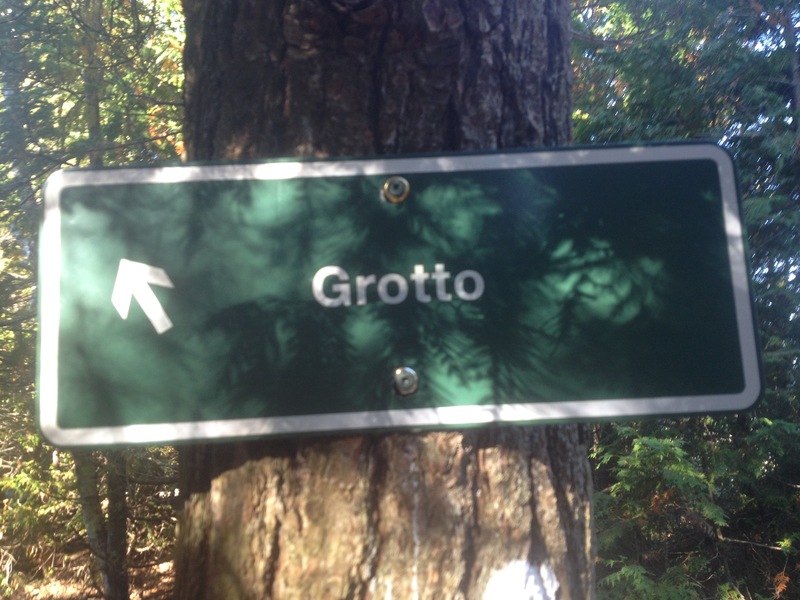 We took the dogs on a hike to the Grotto. On the day we were there in early October there were very few people on the trial. The dogs loved the ride on this zodiac as part of the tour to Flowerpot Island. Pause and take in the beauty of the grotto at Bruce Peninsula National Park. Picnic areas on the bleach provide for a great spot to take a break after hiking the island. Take a jacket. It can get windy on the beach. 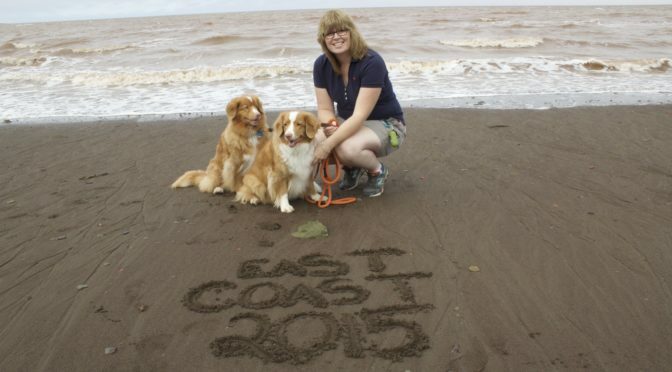 We stayed at Wireless Bay Cottages which allows dogs in several of its cottages. Our cabin featured a small front porch and access to the shoreline of Georgian Bay where we watched the Chi-Cheemaun ferry come in each day. From here we were able to walk to the village to check out various shops and restaurants. 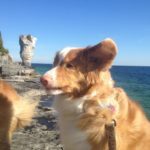 Natural attractions such as the Bruce Peninsula offer endless opportunities to enjoy a restful and educational vacation while at the same time enjoying the company of your dogs. I’ll never forget sitting on the runway at Pearson International Airport waiting to see my dog Willow go up the luggage ramp in her kennel. We were headed to Vancouver for a vacation and she was going to be competing in an agility competition there as well. A lot of planning and research had gone into figuring out how to take a dog on a flight across the country. 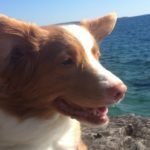 We had chosen to fly with WestJet and the airline’s staff had been great from the minute we booked the tickets to the second we walked through the doors at the airport terminal wheeling a dog kennel with Willow facing out a little more than curious about her next adventure. 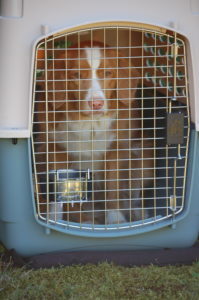 Dogs can travel in airline-approved kennels. They must weigh no more than 100 lbs total including dog and kennel. The WestJet attendant at the counter spied us coming in and said: “You must be travelling with us!” From there we started to relax. 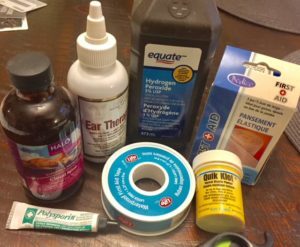 The counter staff processed us then put Willow’s hard-sided kennel through the x-ray equipment and ensured we were well informed about what would happen. A “live animal” sticker went on her kennel and she was placed in a well-ventilated area to await boarding, but it wasn’t until I actually saw her go into the cargo hold that I could breathe easy. Taking your dogs on planes can be stressful but makes your vacations that much more fun once you get there. If you have a small breed dog, taking them with you on air travel is much less complicated to contemplate — generally, if they are under 20 to 22 lbs (including an airline approved pet carrier) they can fly with you in cabin in a suitable carrier under the seat in front of you. But even for those with small dogs the checklist of things you need to consider begins with checking several factors at the time of booking with the airline. Most airlines limit the total number of cats and dogs allowed on board any given flight — usually two. 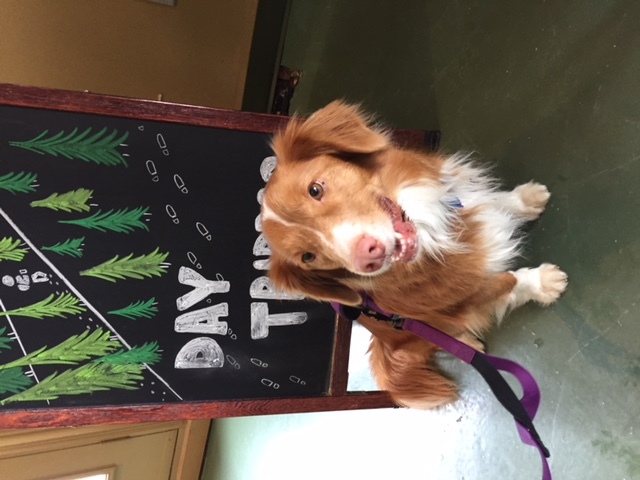 So when you are considering a trip think about booking early to make sure you can get your dog in cabin. 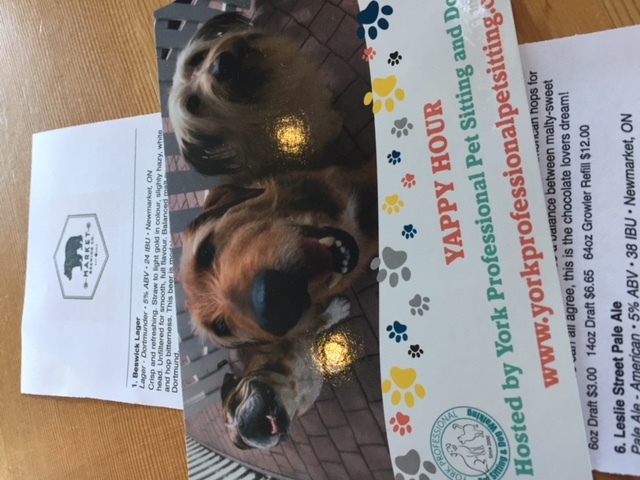 If you have dogs larger than 20 lbs another reason to book early is to make sure that depending on what time of year you are flying that you can get your dog in the checked baggage hold for an early flight (summer months when it’s cooler) or late evening. The same goes for winter — you want to avoid very cold temperatures as the cargo area is not as temperature controlled as the cabin and can be very cold in winter and hot in summer. The number of dogs allowed in checked baggage is also limited to two-to-three per flight (depending on whether it’s a 737 or 767 aircraft.) If you can’t get them on a flight with you or in checked baggage you may have to consider cargo flights which will then mean a different pick up location and possibly a longer wait time as they clear customs and other clearance requirements. 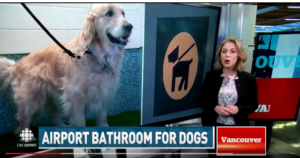 Be sure to check with your veterinarian before booking the flight as well. If your pet is older they may not be in the best shape to travel. Flying can be stressful on an animal and depending on the length of the flight it may be too much for them. Be sure to factor in the time from check in (usually 40 minutes before you are required to check in for your flight) to the time you can retrieve them from the “over-sized luggage” area of the airport. When we landed in Vancouver (YVR) with Willow while WestJet was quick to get her offloaded from the plane I knew she would need to find a relief area. Fortunately the outdoor exit at the Vancouver arrivals area is close by. 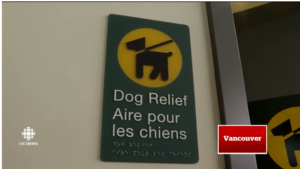 Many airports now have clearly signed “pet relief” areas so you can get them outside. 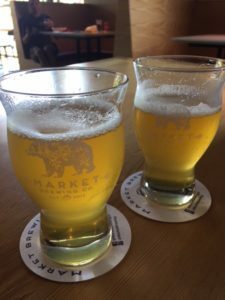 Calgary International airport (YYC) also offers this kind of facility now and Los Angeles International Airport has added 11 such stations — nine indoor and three outdoor locations. Keep your dog’s leash in your carry-on bag so that it’s handy when you get off the plane. 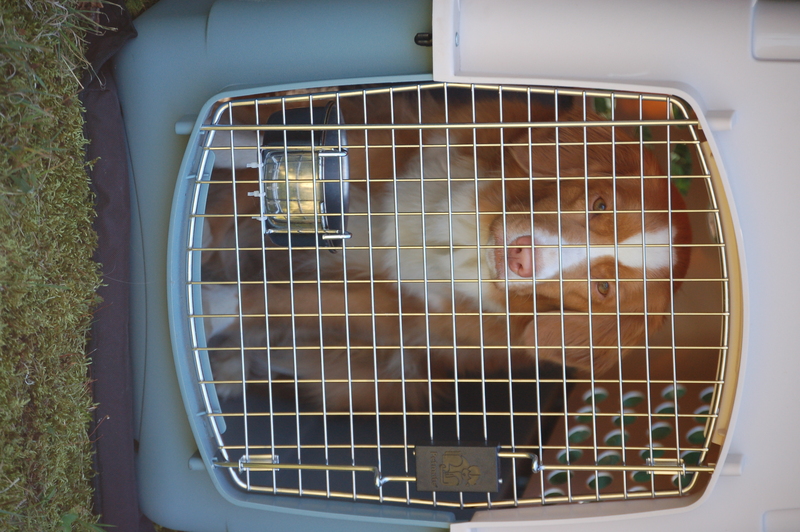 The cost to fly a dog in checked baggage is about $60 each way for domestic flights in Canada and about $100 for trips to the U.S. You must also have an approved hard-sized kennel that weighs in at less than 100 lbs including the dog. Make sure the kennel is large enough for them to stand up and turn around in as well as stretch out. Including a blanket they are familiar with and has some scent from home on it is a good idea to help keep them calm. Certain breeds such as short/snub-nosed (brachycephalic) breeds of cats and dogs cannot travel in the baggage compartment because they are susceptible to increased risks of heat stroke and breathing problems when exposed to extreme heat or stressful situations. It’s a good idea to give your dog some food about four to five hours before the flight and not just before leaving home. This gives them time to digest it. 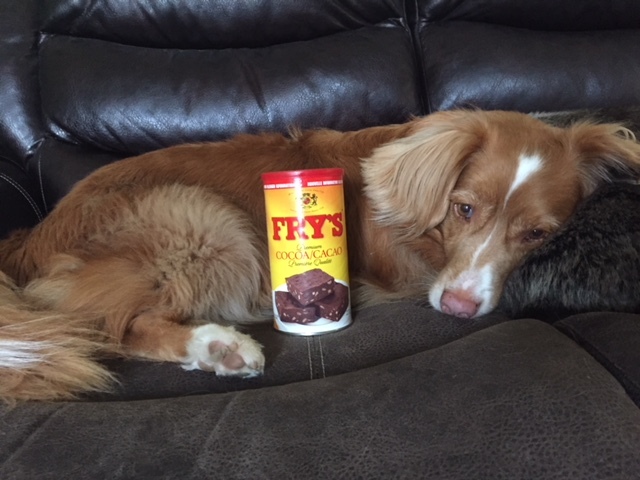 Include a water dish in the kennel and include a few treats. Exercise them well before going to the airport. Don’t wait until you get to the parking garage and need to find a spot where they can comfortably relieve themselves. Write your cellphone number in permanent marker on the side of the dog’s kennel so airport staff can reach you if needed. 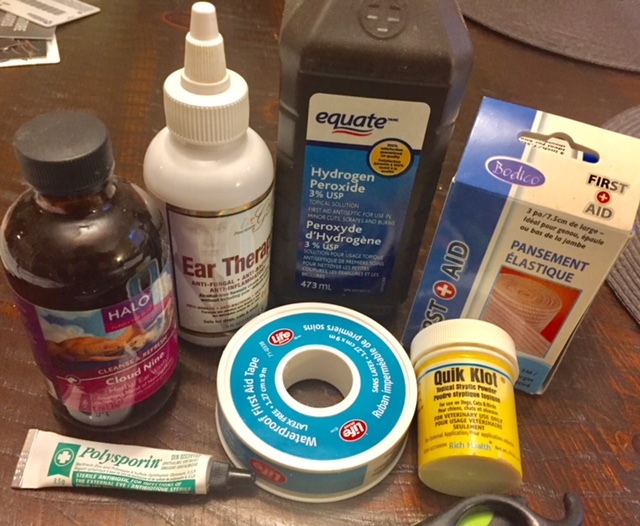 It’s also a good idea to include a note in a plastic baggie, taped to the inside of the crate indicating where your destination is and any other back up phone numbers in case anything happens to you on the journey. Check your preferred airline for their requirements and restrictions. Above all else, travelling with dogs also requires using good judgement and knowing when your pet needs to take a break. Ideally you both arrive safe and ready to enjoy your destination.